In more recent years we have seen a explosion of entrepreneurial desire and high growth startups. With Entrepreneurship on the rise, we are seeing several emergence’s of startup ecosystems/clusters around the world. More and more cities are realizing the value of having startup ecosystem, as it bring economic prosperity and innovation (along with other perks). Much of the focus being placed into actions and programs in how we can develop an entrepreneurial ecosystem. Being in Berlin for a year studying their startup culture, I’ve come to realize a unique culture parallels the thriving entrepreneurial ecosystem. With this in mind, perhaps our focus in the development of startup ecosystems is in the wrong place and maybe we must address culture first before devising ways of making it work or at least try leveraging culture as force for developing startup ecosystems. 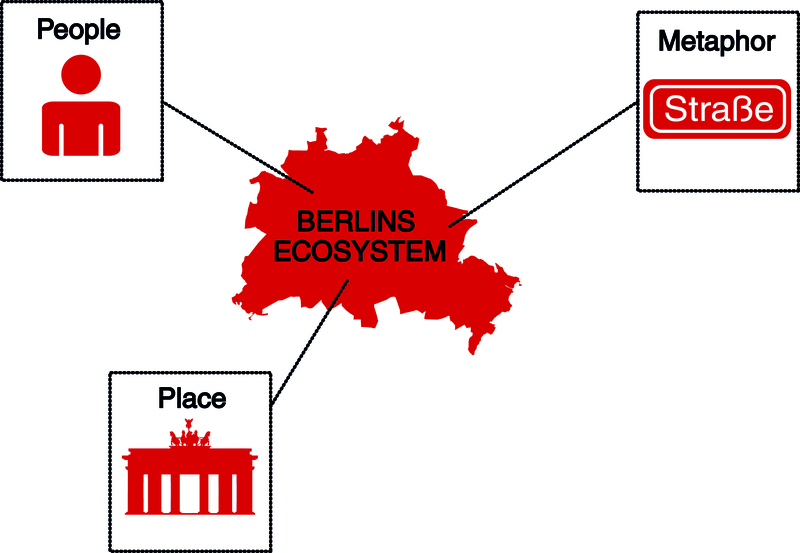 I can’t say for definite if Berlin model works for everyone, there are after all, other successful ecosystems which have their own methods and specialties. I do think we can take elements of their startup culture, and try and enhance those traits in other aspiring startup ecosystems. 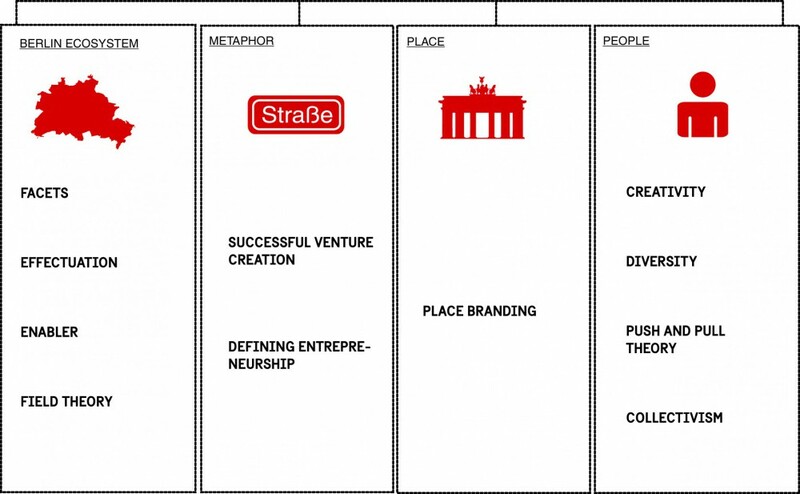 With that said, I have used my Bachelor Thesis to break down Berlin Startup culture. It becomes very easy for an Ecosystem to be sustainable and require less effort in terms of developing a community once critical mass is becoming achieved. This means, less influential actors, characters and institutions are needed to play the role of change maker. Therefore, this self sustaining ecosystems relies on developing more expert/better entrepreneurs. There are several theories which could be examined in relation to this. This acronym stand for; Focus, Advantage, Creativity, Ego, Team, Social. Focus – determines the drive, devotion and the willingness of the entrepreneur to complete tasks and get things done. This area can of entrepreneurship can only be determined on an individual level, therefore there must be an assumption in which those who are devoted to their business must have the required Focus in order to continue to progress their business. In Berlins case, An ecosystem can at least to the extent support their focus by constantly inspiring people through networking which encourages a level competitiveness and at the same time support the entrepreneur. Advantages – is discovering winning opportunities in the market. Although not everyone have becomes the winner in Berlin Start-up Ecosystem. It has demonstrated that there winners emerging from the area. With the likes of Sound Cloud, Zolando, Delivery Hero, and 6Wunderkinds all having a large popularity within the web industry, and have gained some significant investment in past few years. It appears there is no shortage of winning ideas. Thus, success stories encourages and motivates entrepreneurship to occur, because people perceive that they can make it as well, although, they may not make it. Creativity – An entrepreneur ability to come up with ideas is considered highly important. Berlin creative hub encourages entrepreneurial creativity which means there is not short supply of original ideas or new business processes or opportunities available to enhance and encourage further entrepreneurial activity. Ego – inner – refers the desire to achieve something, or make a change, or create legacy. The belief to make changes can be created by oneself. However, there are several present entrepreneurs which have worked for start-ups prior to creating their own business which may have inspired them and this can be an influence into becoming an entrepreneur. If the start-up ecosystem has been around for a long time it can perhaps also create a culture of entrepreneurship. Therefore, the ecosystem can influence the ego trait. Team – the ability to develop a team’s which extends the business further. There are constantly meetups which allows for many networking opportunities in which giving the entrepreneur the ability to find the right people to create a team. In Berlin, through it critical mass, reputation and geographical location have made it a hot spot for talent in Europe. Social – is the cause and motivation of doing the business. These trait can only be determined through personal desire, and what business activity they want to do. However, since the Berlin start-up environment mainly consists of IT start-ups, it might be an influence on the businesses activity. This suggests and higher likelihood in an ecosystem specializing in a specific industry. A theory developed by Sara Savasathy (2008) about expert entrepreneurs and the process they take when developing successful businesses. Click here to get easy understanding of the theory. Due to Berlin tolerance towards people who seem or appear unusual, entrepreneurs can discover themselves. The whole process of self actualisation, allows them to explore their creativity for the Bird in hand principle to be further enhancing entrepreneurial ability. The affordable loss can be accomplished due to low level of rent, cheap working spaces, and an active IT industry. Lemonade Principle gives the surprise leverage by having such diverse level of population any problems could be anticipated earlier through testing with different individual. Although, this could also be considered more inherit factor which would be difficult for the external environment factors to influence this trait. Patchwork Quilt principle is easily supported by start-up ecosystem, there is constant networking events and meetups for everyone to attend or at little cost. It becomes a great opportunity for them get the necessary people required for growth and etc. It small community like cafes, aid the ability to strike up a conversation with random people further increasing network ability. Pilot the plane is by focusing on what they can control they can reach a desired outcome. enablers are able to give guidance and guide entrepreneurs on the right track to success. The Enabler element is a supportive structure for encouraging entrepreneurship. This refers to the actors/institutions that enable entrepreneurship. The perceived presence and actual presence of enabling entities with the ecosystems (referring to incubators and accelerators) encourages a culture and place to become more entrepreneurial. Entrepreneurs are, therefore, less anxious about starting a startup in the first place as they can receive support reaching which ever stage they are trying to attain. There is a perception of large quantity of enablers ( typically incubators, coworking spaces and accelerators) present in Berlin startup ecosystem therefore attracting people to Berlin and encouraging them to start businesses. Taking Bordieu’s (2005) approach to the field, is defined as the arena to which agents within the field interact with other agents. Agents are individuals who have disposition to the habitus which there are a set of preset characteristics developed throughout constant interaction with social environment throughout their life. These agents manoeuvre around the field using their forms capital (social capital) . We could analyse a start-up culture by analysing the start-up ecosystem (field) and actors within the field (agents). These actors would be entrepreneurs/venture capitalist and investors/incubators/accelerators/start-up employees. The presence of all the mention actors is important but also the interaction plays a crucial role. The activeness of each actor in field plays huge role in an ecosystem. For the investor, going out empowering their presence in the environment and trying to gain more capital by actively seeking the best startup, rather than waiting for startups to find them gives at least the illusion of activity in an environment. This is good signs of active startup ecosystem. The field in the model refers to defining principles or phrases. In different contexts, the definition of words can take on life of their own and have very ambiguous meanings. This can have huge influence in startup culture, as word like entrepreneurship and success can have different meanings across the globe. Defining success and Venture creation, is also important in the theoretical framework because it can determine what are the important activities for the entrepreneurs and what sort of indicators of success do they analyse themselves as. If the goal of analyzing this definition is to find a minimal defining factor. Therefore, although a financial indicator is important to start-ups, it is not the sole defining success factor of start-ups. We must then analyse the success factor as making a sustainable business. These success factors in which business owners can, or eventually, make living out of as a success. This would mean that profit as success factor would still fall into making a living. Other additional success factors, include spending time with family, freedom and independence, and job satisfaction. This means that in Berlin, most entrepreneurs are generally seeking to at least make living out their businesses with focus or trying to be profit maximizing. We then interpret an ecosystem which can develop entrepreneurs that can at least make living off their startups. Places themselves can factor in developing ecosystems. The area relies on the city as whole like perception of the city being very industrial and corporate can deter people from wanting to be entrepreneurial as it may seem their high barrier to entry. However, if a place brands itself as startup city then it becomes more attractive and essentially creating a movement as well. Berlin is quickly becoming a global city, it is a rising city and considering it has only been 26 years (closing in on 27 years) since the fall of the wall, it has come a long way. In fast few years there has been a focus on place branding. For cities to attract the top talent and investment, it needs to brand their city really well. Place branding is typically defined as a set of central, enduring and distinctive characteristics that actors ascribe to a place. In this context, the Berlin uses several methods which I won’t go into to many details. It brands several other scenes like it’s music ,nightlife and art scene, which attracts the Generation Y (Millinials) that are striving for a better work-life balance. Business owners also play crucial role in representing the city, this refers to both large and small businesses. Small business represent the very social dynamics aspect of the city, where most shops have squeezed as much seating into a small area which open up great conversations. The large quantity and diversity represents a mix of different cultures and internationalization. Larger businesses like Soundcloud were in the forefront of representing growing Startup Ecosystem, suggesting a movement to co-creation and digital technologies. Let’s not forget the successes of Rock Internet, with the likes of Delivery Hero and Zolando in their portfolio. By branding the ecosystem with successful startups, it encourages a movement, and a reliance on an ecosystem. In the least part, it provides hope for aspiring entrepreneurs. One of the most important fields, are the people. The affects on people define how and why they have the urge to develop businesses. For Example, being Creative suggests better ability in problem solving. It is, therefore, important we analyse people perception of each other and themselves. Creativity as unlimited application of knowledge. To be creative means using our knowledge without being limited by academic, professional, social and cultural baggage. The result of unlimited application acknowledges that better be thinking from small everyday challenge to complex problems; you become better at applying the knowledge to the task or problem at hand and become better at using knowledge which we would normally regard as irrelevant to biases, principles or habits. This suggests the importance of the creative trait and how it relates to entrepreneurship. Berlins creative environment(music and art), are highlighted all over town with big giant murals to bands playing in small clubs. People here, undoubtedly, share at least the creative spirit. The importance of having creativity within the community allows entrepreneurs to think outside of the box or solve complex problems through creative and innovative thinking. The idea of creativity is reflected in several aspects. Graffiti are artifacts which symbolize the presence of creativity and allowance or at least tolerance of creative freedom. In another aspect, many people have this attitude being able to dress and look how they want and not care what people think about it. This can suggest similar approach to startup creation in Berlin as well. Migrating workers contribute to innovation through scale abilities and work ethic but also brings and blends new ideas and perspectives from their own respective cultural backgrounds. Much related to creativity, although, from the sense where instead of focusing on individuals it refers to wisdom of crowds. There is remarkably high percentage of foreign founders in Berlin and about 40% percent of startup employees being foreign. Berlin has very international attitude and is very easy for many people to get around by speaking English. The diverse group of people not only bring their own backgrounds into the mix of idea but they also bring representation of their own cultural environment, therefore, making it possible to research country without having to spend a lot of time and money research another environment. Allowing businesses to bootstrap further. The push and pull theory argues that there are 2 forces working in influencing entrepreneurial intention. Gerry Segel (2005) states that “push theory argues that dissatisfaction, difficulty finding employment, insufficient salary, or inflexible work schedule. The pull theory contends that individuals are attracted into entrepreneurial activities seeking independence, self fulfillment, wealth, and other desirable outcomes.” This theory relates to mainly each individual themselves and there different threshold of satisfaction. We cannot simply explain the combination which most people in Berliners take in order to start fulfilling entrepreneurial intention, but there are a lot reasons related to their job satisfaction in terms of ability to be flexible and taking actions (e.g. making changes at the organisation; harder for large business to make changes, longer process of being in the position to even propose changes (job dissatisfaction); Startup are seen as my flexible work environment, can immediately propose changes (attractive prospect)). There can be many other reasons for entrepreneurial intention, the important aspect is there are forces work in both pushing people and pull people (e.g. therefore a startup ecosystem shows attractive qualities, and large corporate town or organisation show unattractive qualities). Berlins Community of entrepreneurs are driven through collaboration and attitudes to share their wealth of knowledge. This thought process comes from the idea that if they help each other then when the ecosystem grows they will all benefit from this. Setting this kind of culture encourages entrepreneurship and growth of entrepreneurship ecosystem. A community becomes a very supportive system for a clueless entrepreneurs if they have the impression that there is more collaborative environment rather than an individualistic. There is a reactive factor that suggests reciprocation to help others as well (giving back to the community). The collective approach works on encouraging entrepreneurship not intimidates entrepreneurship. This model may not work for every culture, country or city. I don’t urge or recommend people to imitate it either, as Berlin is not the only successful ecosystem out there. It is worth keeping in mind that, there are elements which can be borrowed and that do help encourage entrepreneurship. If you want to develop your startup ecosystem, I encourage to you find out what drives people to want to be entrepreneurs, observe social interaction between people to understand how as an ecosystem develop way to encourage networking, and in general try to get the feel of the kind of startup culture currently existing. I feel that too many people try to bulldoze this idea of getting more people to become more entrepreneurial, it far more easier to leverage culture and focus on what people good at. Put the ecosystem in the position to succeed, and the startup culture will start shinning through. This entry was tagged Berlin, Culture, Entrepreneurship, Startup Ecosystem. Bookmark the permalink.